Not too long ago, the fate of the historic rocketship at Bluebird Park was in question, but concerned citizens rallied to raise the funds to restore the rocketship... and also renovate the entire Bluebird Park playground. 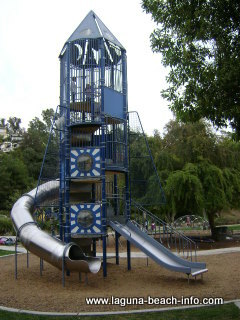 This Laguna Beach park has extensive playground equipment that children love! You'll find swings, climbing equipment, numerous slides, a half-court basketball court, and of course- the historic rocketship! In addition, this park has restroom facilities and payphone for emergencies. Bring the kids out to play in the childrens paradise of Bluebird Park! Every year, the City of Laguna Beach hosts the "Music in the Park" Summer Concert Series, where locals flock to listen to live music played in the middle of Bluebird Park. Come bring a picnic dinner at sunset (5pm-7pm) and enjoy fantastic live music on Sunday night's during the summer months of July and August. Share Your Bluebird Park Experience and Review! Do you have a great story, experience, or photos from Bluebird Park! Share your stories, pictures, and reviews of this Laguna Beach park! Enter The Title of Your Bluebird Park Review or Experience! You can find parking along either Bluebird Canyon Dr or Temple Terrace with direct access to the park.